The man is facing charges and an officer is under investigation. 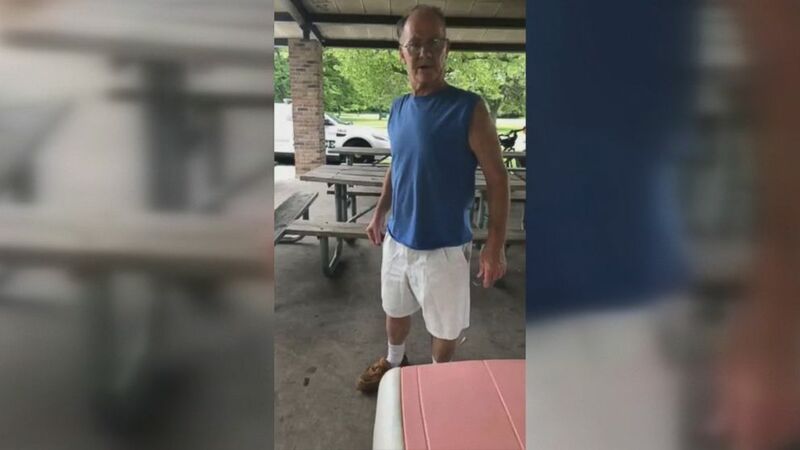 A 62-year-old man appears to be in need of geography lessons after he allegedly accosted a woman for wearing a T-shirt with an image of the Puerto Rican flag in an Illinois park. "You should not be wearing that in the United States of America," the man can be heard saying to her on a video she posted on Facebook. "Are you a citizen?" Mia Irizarry posted the video of the incident that shows the man, who is facing charges, verbally harassing her at a pavilion that she said she rented with the appropriate permits. The man, Timothy Trybus, has been charged with simple assault, according to an incident report. ABC News has been unable to reach Trybus. Irizarry is shown in the video wearing a sleeveless shirt that is made to look like the Puerto Rican flag, and has the name of the U.S. territory printed on it. That appears to have set off the man. "Are you a United States citizen?" he asked again, prompting Irizarry to say she is. "Then you should not be wearing that. You should be wearing a United States of America [inaudible]." (Mia Irizarry/Facebook) A then-unidenfied man, pictured, was shown harassing the woman, questioning her citizenship. Puerto Rico is a U.S. territory and Puerto Ricans are U.S. citizens, dating back to the signing of the Jones-Shafroth Act in 1917. Later in the video, Irizarry is shown asking a Cook County Forest Preserve District police officer for help in getting the man away from her. The officer does not move any closer to the pair or appear to do anything to actively end the situation. "As you can see the police are not even -- he's not even grabbing him. Like this guy is just walking up to me. He basically got in my face, damn near almost touched me," Irizarry is heard saying to the camera during the incident. 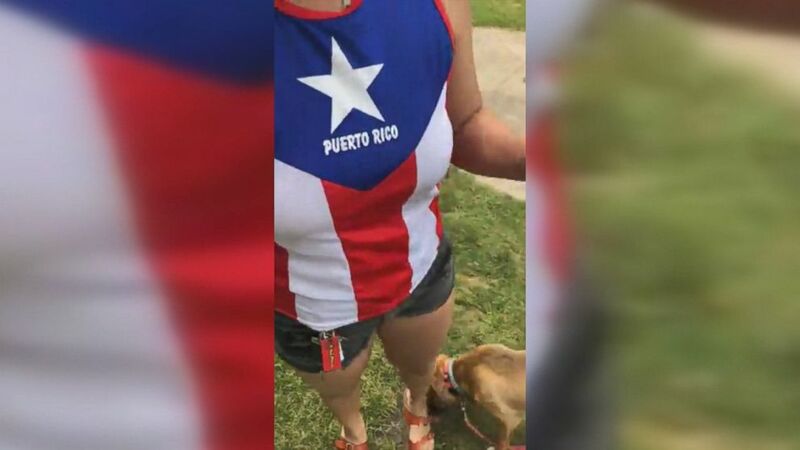 (Mia Irizarry/Facebook) Mia Irizarry posted a video of the June 14 incident on Facebook and showed that she was wearing a shirt that looked like the Puerto Rican flag. Later in the video, a female officer can be seen arriving on the scene and directly engaging the man. "Hopefully, this officer will actually do something," Irizarry is heard saying when the second officer arrives. The female officer talks to the man, telling him, "Listen, you don't need to be badgering anybody." The female officer is heard telling the man that he may face charges "for not being compliant, and you don’t come here harassing people." "If you're drunk, you don't belong here," she is heard telling the man. Irizarry did not immediately return ABC News' request for comment. 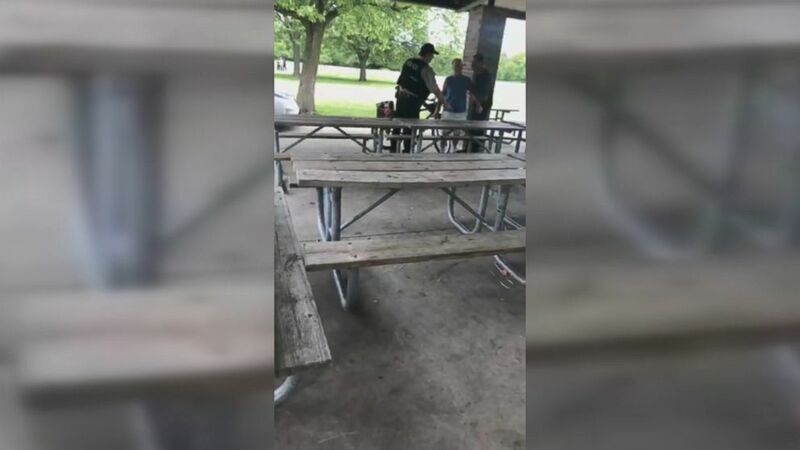 Irizarry posted the video on her Facebook account after the June 14 encounter at Caldwell Woods, which is part of the Forest Preserves of Cook County. Agency officials released a statement July 9 saying they were aware of the incident and video and "immediately launched an investigation pursuant to our personnel policies into the response of our officer." "The investigation is ongoing and the officer involved has been assigned to desk duty pending the outcome. The intoxicated individual involved in the incident was arrested and charged with assault and disorderly conduct," the Forest Preserves tweeted. Forest Preserves spokeswoman Stacina Stagner called the video "very disturbing." (Mia Irizarry/Facebook) The first officer on the scene did not appear to intervene and has since been placed on desk duty. Stagner confirmed that the man who was shown harassing Irizarry was charged by the preserve's police department. Stagner and the Forest Preserves are not the only ones upset by the video, as Puerto Rican Gov. Ricardo Rossello tweeted about the "undignified event," calling the man a bigot and finding fault with the first officer who "did not interfere." "I am appalled, shocked & disturbed by the officer’s behavior," Rossello posted in a tweet.